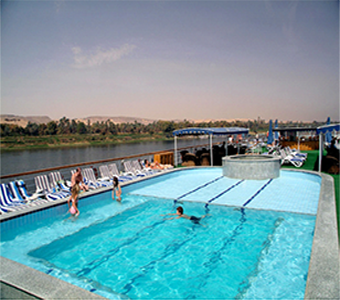 Cruises on the Nile are the perfect way to enjoy ancient Egypt history. 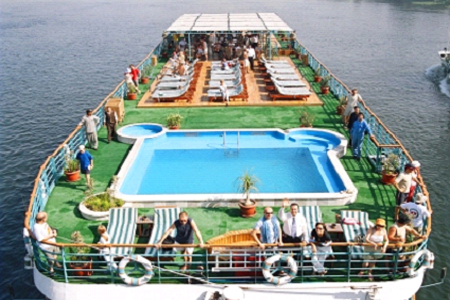 Floating hotel is what the Egyptians call the Nile river cruise ships. A hotel that moves with your Egypt vacation removing the hassle of changing hotels, packing and unpacking daily. A Nile river cruise is the perfect way to relax and immerse yourself in over 5000 years of history.5* Nile cruises including outside, Nile view cabins, meals, sightseeing and more starting at only:Cruising the River Nile is a truly unforgettable experience where each day brings you a different opportunity to explore the sights or enjoy a different view. What better way to discover this magical waterway and the riches of Egypt, the Co-operative Travel has the perfect Nile cruise holiday for you. All Nile Cruises of which leave from Luxor. Cruises include stop-off points at the various attractions, where a qualified Egyptologist will give you the low down on Tutankhamen’s tomb, the Valley of the Kings and the Pyramids. At Aswan you can learn to belly dance like a native, as well as visit the ruins. All 5 Star nile river cruises and Lake Nasser Nile cruises, regardless of category, feature outside river view cabins with private baths, individually controlled air-conditioning, telephone, T.V./video. meals, transfers to/from antiquity sites, entry fees plus the service of a fluent English speaking guide (unless you prefer another language. 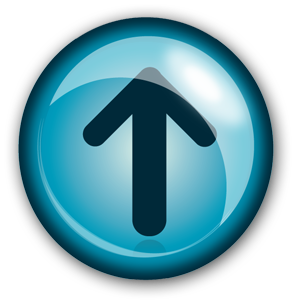 We have guides fluent in virtually all major languages). Service charges, taxes and port fees. 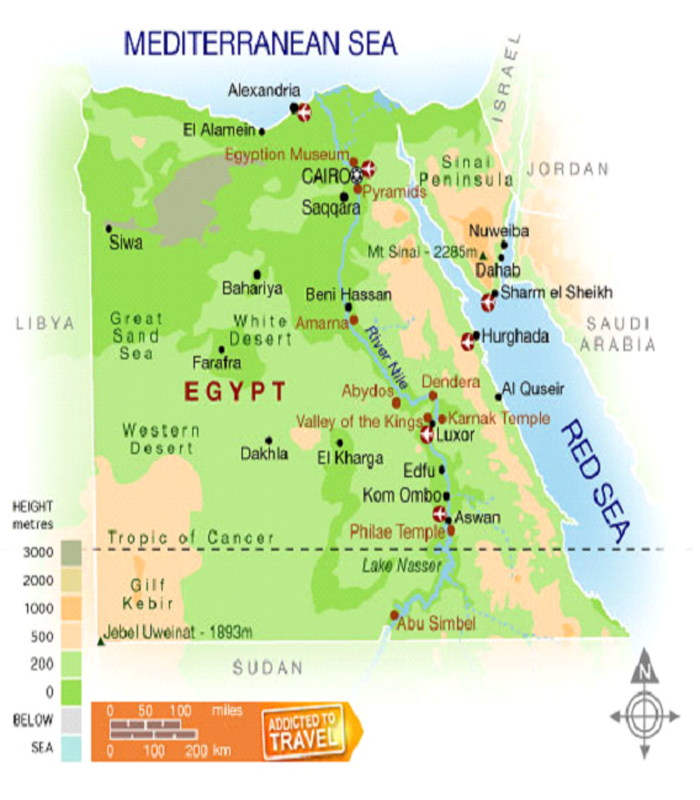 What are the areas where the Nile Cruises sail? 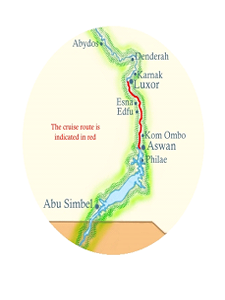 Nile cruises travel between Luxor to Aswan and vice versa. In this trip you will visit Isna, Edfu and Kom Ombo. The distance from Cairo to Luxor is 671km, and the distance from Cairo to Aswan is 879 km. How to reach the Nile cruise in Luxor or Aswan? If you are in Cairo, it will take you one hour on plane and 12 hours in the sleeping train. If you are traveling from Hurghada, it will take you three hours in a car. * - All Nile boats in Egypt are subject to regular inspection by the governmental authorities to ensure the safety of passengers. * - ATMs are used in all the main towns and tourist destinations, such as Cairo, Alexandria, Luxor, Aswan, Sharm El-Sheikh, Hurghada, and Dahab. Most of the cash machines there accept major credit cards, like Visa and Mastercard. * - In Egypt, one can walk around free and without fear of any kind, either from the police officers or from attackers. Crime rates in Egypt are very low compared to the other countries. It only costs you not leaving your baggage or other valuables unattended. The Egyptian people are hospitable and warm. It is true that Egypt faced few tourist attacks but for the average rates in Egypt these incidents mean nothing. The tourist police provide utmost security for tourists in hotels, roads, and tourist spots. Visit the High Dam, the Unfinished Obelisk, sailing by Felucca & view of Agha Khan Mausoleum. Visit the temple shared by two Gods Sobek & Haroeris. Sailing to Luxor passing through the Esna Lock. Upon arrival time in Luxor visit Luxor Temple. Cross the West Bank to visit Thebes Necropolis, Valley of the Kings, El Deir El Bahari of Hatshepsut and Colossi of Memnon facing the Nile. 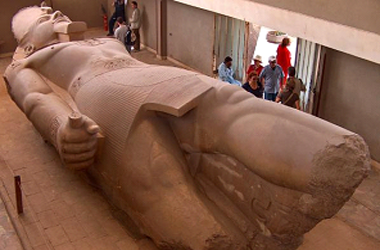 Visit Karnak and Luxor Temples. Sailing to Edfu, Visit the Temple of Horus. 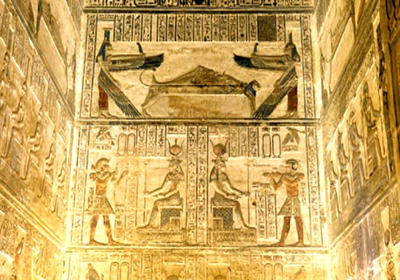 Visit the Temple shared by the two Gods, Sobek & Haroeris. N.B. In case of long queues of boats at Esna lock, Kom Ombo visit and sailing to Aswan will be on Thursday morning instead of Wednesday evening, and in this case Aswan visit will be P.M. instead of A.M. Sailing by Felucca and view of Agha Khan Mausoleum. 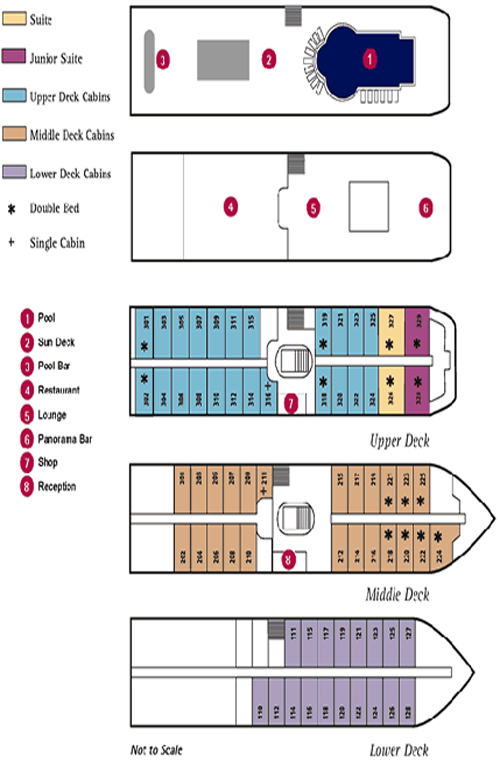 Deck 2: Reception, lounge bar and cabins. Deck 3: Coiffure, Internet Café, Gift Shop & cabins. Pack suitable clothing for the season to be able to ‘cover up.’ Smart casual dress is acceptable, however men are required to wear trousers for dinner. Whilst on excursions ensure that you have comfortable footwear and be prepared to cover up (particularly ladies) if necessary - remember Egypt is a muslim country. Remember that many excursions commence very early in the morning to avoid the extreme heat of the sun in the middle of the day. You may have to walk through other cruise ships to reach your vessel as they are often moored close together whilst in port and due to the large numbers of vessels direct access is not always possible. Take care using gang planks. This may also result in views being obscured whilst docked. Enjoy the experience this cruise offers - the intention is that the boat is not restrictive, but a vessel that allows you to visit fabulous Egyptian sites. However certain passengers may find that they are less able to cope with some excursions which can be energetic and don’t forget the boat has several decks! We do not as a result recommend that people with walking difficulties take a Nile Cruise. On the money side, our advice is always to have various options where possible (i.e. Travellers Cheques, Credit and/or Debit Cards and local cash ). Credit Card facilities do exist but since this an electronic process this method of payment can not be assured. It is customary to tip on Nile Cruises. Tips are partly a source of income. normally collected at the beginning of the cruise. Please note that this in only an indication - ask us for further information. Excursions are subject to change at any time due to weather, river levels or just sheer volume of Nile traffic (there are more than 300 vessels currently). Note that due to essential maintenance the Esna Lock closes twice per year resulting in some disruption to Nile Cruises. This occurs during the first 2 weeks in June and December. We advise customers to avoid this travel period where possible as a result. If you choose to go on a Nile cruise, make sure that the cruise is taken as “all inclusive”, i.e. accommodation, tours and transportation! This option is the best way for you to see all the possible Temples on route. We would personally recommend, for health and safety reasons, to choose only the five star Nile cruises !. Lake Nasser is located south of Aswan and stretches almost 300km. Cruising Lake Nasser is an unforgettable experience; the lake itself is beautiful and has a charming atmosphere, and the area is home to the Temples that were so painstakingly moved in the 1960’s from the rising waters of the lake by UNESCO. Journey along the lifeline of Egyptian civilization, experiencing incredible sights that include ancient temples, tombs, and local villages. Measuring 4,160 miles, the Nile is the longest river in the world, flowing north from Lake Victoria through Uganda, Sudan, and Egypt. Passing rainforests, mountains, savannas, swamps, and desert landscapes, it culminates in the fertile Nile Delta and drains into the Mediterranean Sea. Lake Nasser is a vast reservoir created in the 1960s when the High Dam was built to harness the waters of the Nile. As the waters rose, they threatened to engulf many sites of historical significance. Several ancient Egyptian and Nubian archaeological sites were dismantled and moved to higher ground, the most important being Abu Simbel. As you sail the tranquil waters, it is hard to imagine how much still lies submerged. The lake is remote and sparsely populated by fishermen and Bedouin camel and sheep herdsmen. A Lake Nasser Cruise holiday offers an unrivalled journey of discovery and natural beauty, in the comfort and luxury of deluxe accommodation. - It may be necessary to amend your Lake Nasser cruise itinerary due to prevailing local circumstances. We will Endeavour to provide you with as much notice as possible, should this be necessary. - As so many sites are visited, a Lake Nasser cruise holiday may not be suitable for the very elderly or people with walking difficulties. - Optional excursions shown may be available to pre-book, and where an excursions is capacity controlled and participants are limited, it may be advisable to do so. After having your breakfast you will be sailing and observing Kasr Ibrim; the only major archaeological site in Lower Nubia. 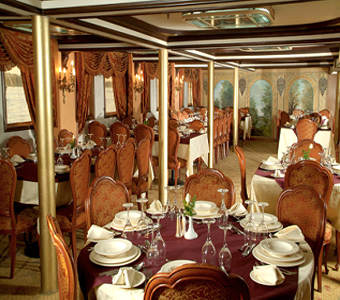 You will be served your lunch on board as you are sailing towards Amada; visiting Amada. Continue sailing to Wadi El-Sebou; for the light Show. After having breakfast, you will be visiting Wadi El-Sebou which means the Valley of the lions and comes from Arabic because of the sphinxes guarding the temple. 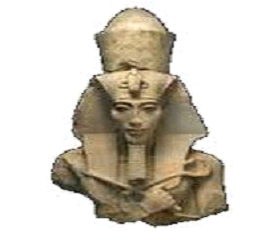 And you will also visit Dakka Temple which was dedicated to Thoth; the God of wisdom. Continue sailing to Aswan. You will be served your dinner on board and enjoy Nubian show. Our representative will meet and assist you upon your arrival to Aswan and transfer you for embarkation on your cruise before having lunch. You will be served free dinner Nubian Show. After having your breakfast; you will visit Kalabsha; which houses several important temples, structures and other remains. Also you will have the chance to visit Beit El-Wali, a rock-cut temple built by Ramses II. Continue sailing to Wadi EL Sebou. After having breakfast, you will be visiting Wadi El-Sebou which means the Valley of the lions and comes from Arabic because of the sphinxes guarding the temple. 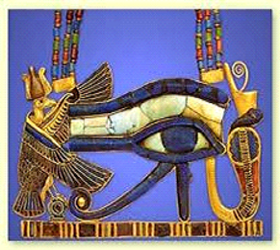 And you will also visit Dakka Temple which was dedicated to Thoth; the God of wisdom. Continue sailing to Amada. You will be served your lunch on board. Visiting Amada after your lunch. After having your breakfast you will be sailing and observing Kasr Ibrim; the only major archaeological site in Lower Nubia. Continue sailing to Abu Simble. At you arrival to Abu Simbel (Music and Cocktail) you will visit the temples of Abu Simbel. The Cairo-to-Luxor section of the mighty River Nile has reopened to cruise ships after a 15-year ban put in place due to concern over water levels. Until recently it was only possible to cruise along the Upper Nile, between Luxor and Aswan; but now travelers can embark on an extended adventure. Discover Egypt's 14-night journey on board, The Nile Cruises takes passengers from Cairo to Luxor via Aswan (and vice versa), with excursions to some of the country's best sights. Before boarding the luxury vessel, guests have time to explore Cairo, visiting Ancient Egypt's iconic landmarks, The Great Pyramid, one of the Seven Wonders of the Ancient World, and the Sphinx. 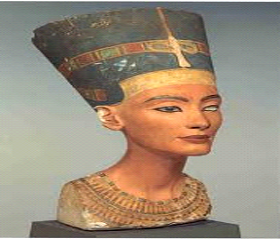 A trip to the Egyptian Museum gives guests the chance to read up on the fascinating history of the capital, we can arrange more sights in-out Cairo if you wish before sailing. The ship then sets sail down the Nile, stopping at the white limestone temple at Abydos, built by Seti I, and finished by his son, Rameses II; the tombs of Beni Hasan, which date back 2,000 years BC; and Denderah Temple, a site for chapels and shrines. At the West Bank, passengers alight to see the Valley of the Kings, lined with tombs and chambers built for Egypt's great pharaohs; the Mortuary Temple of Queen Hatshepsut, dedicated to the sun god Ra; and the Colossi of Memnon, where two twin statues of Pharaoh Amenhotep III stand. Agatha Christie fans will be delighted to visit the Karnak complex, where the Temple of Amun was used as a location in Death on the Nile (Linnet was almost killed here by a falling boulder). An optional day trip (by coach or air) takes guests to the UNESCO World Heritage Site Abu Simbel, and the Great Temple of Rameses II, where, in Death on the Nile, Jacqueline (played by Mia Farrow) turns up to spoil honeymooners Linnet and Simon's outing. Passengers that choose to stay on board Alexander the Greatcan take in the sights and sounds from the pool deck, or indulge in a spa treatment. Lastly, it's onwards to Aswan, to its High Dam and the Unfinished Obelisk (the largest known), before returning to Luxor. Also Included: All taxes, service charges, port charges and entrance fees to sights mentioned. All meals throughout the trip are included. (Breakfast, lunch and dinner). All transfers, meeting and assistance and baggage handling is included. "If any modifications or changes are needed to this package, that will be accommodated at an extra cost". Not included: Items of personal nature, such as phone calls, wine, tips,etc. peak season supplement per person if traveling between Dec. 09th to Jan. 14th or from Mar. 19th to Apr. 23rd. EXTENSIONS & OPTIONAL TOURS: Extra days and optional tours to other sites that are not included are available upon request. * This tour sometimes gets cancelled as far as 6 month because of water levels of the Nile river. 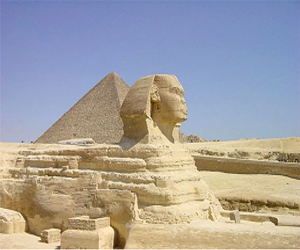 If you need a different tour package of Egypt, we will customize it for you. Breakfast, a.m. Saling to Minia – P.m. Visit Tel El Amarna, Then back the cruise, and overnight. For shopping. Then back the Cruise and overnight.